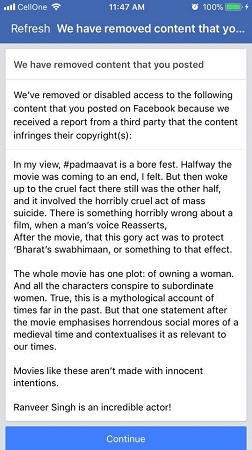 Environmental activist Leo Saldanha's post, calling the movie a 'bore fest', was pulled down after Viacom 18 claimed that it was a 'copyright infringement'. On February 2, Leo Saldanha, a well-known environmental activist was shocked to see that Facebook had taken down his post, which had criticised the controversial Sanjay Leela Bhansali film Padmaavat. When he wrote to Facebook to probe the reason behind this move, the reply was even more bizzare. The social networking site’s response was - Saldanha had “infringed the copyright of Viacom18, the official distributor of the film Padmaavat”. “The whole movie has one plot: of owning a woman. And all the characters conspire to subordinate women. True, this is a mythological account of times far in the past. But that one statement after the movie emphasises horrendous social mores of a medieval time and contextualises it as relevant to our times. Movies like these aren’t made with innocent intentions. Ranveer Singh is an incredible actor!” his post said. However, Facebook took down the post after Viacom18 reported it claiming that Saldanha had infringed on its copyright. When he wrote back, arguing that his post was a mere comment which did not violate anyone’s copyrights, Facebook wrote to him stating that he would be permanently blocked from using the site if his post continued to infringe on copyrights. 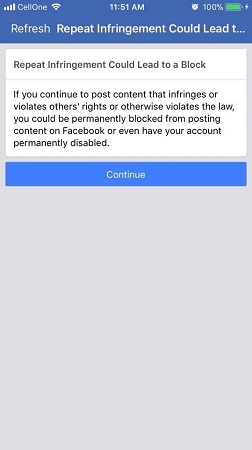 “If you continue to post content that infringes or violates others rights or otherwise violates the law, you will be permanently blocked from posting content on Facebook or even have your account permanently disabled,” Facebook’s reply to Saldanha reads. The social networking site’s administrators asked Saldanha to obtain Viacom18’s permission in order to post the same content once more. Strongly reacting to the turn of events, Saldanha wrote a Facebook post directed to the CEO of Viacom18, asserting that it was his fundamental right to express his opinion. “I am not merely dismayed, but shocked, that FB in fact has not merely deleted my comment from my page, without any prior notice to me, or even bothering to seek my consent, but that the company has now threatened to kick me out of Facebook if I reshare the comment in any form. Besides, FB claims I have similarly ‘harmed’ your (Viacom18’s) interests in the past! !” Saldanha’s post reads. Speaking to TNM, Saldanha says that he is deeply offended by the messages he received from Facebook and the allegation that he had violated anyone’s rights on any social media platform. “Anyone should be free to express in any form, their views about public matters. This includes the right to agree, disagree and the right to dissent. I also maintain that I have never used threatening language while offering my opinion on any issue that is public, or of any public person. The fact that Facebook pulled down my post is a serious issue. This only shows that Facebook leans towards those with financial muscle. Viacom18 clearly does not want critical views for the movie,” Saldanha says. He maintains that this move was an “attack by the corporation on the freedom of expression” and that this would only lead to a culture of conformism and silence. “I am an activist and for me this is a serious threat to individual rights. What about thousands of other people who face the same issue? People like us are aberrations and those who are afraid of our opinions are only trying to smother our voices. Democratic spaces must be liberating, especially social media, but technology is being used to terrorise people into conformity and this politics of silence is a threat to individual freedom,” Saldanha alleges. Director (Emerging Research) at The Bachchao Project, Rohini Lakshane says that the content post by Saldanha, in her opinion, does not infringe on the copyright of Viacom18. “Broadly speaking, this is usually a pressure tactic to intimidate the individual, especially if the person has a large following on Facebook. However, Facebook automatically takes down any post which is reported by a party alleging copyright infringement. Facebook asks the parties to settle the dispute directly as it is not authorised to settle the dispute. Only a court of law can,” Rohini says.